UL Listed as a complete wire assembly that complies with the 2017 National Electrical Code: Articles 348.20(A)(2), 348.22, 410.117(A), (B) and (C), and 410.137(C). File #E87199. Significant Contractor time and labor savings! 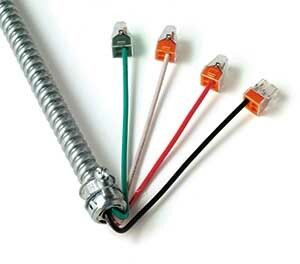 Pre-attached connectors add speed and dependability when finalizing fixture whip terminations. WAGO® Push wire 4-port connectors on each end of the QuikWhip. Two (2) Die Cast "Snap-In" Connectors on each end of the QuikWhip. Snaps directly into the fixture housing. No tools required to install the QuikWhip! A cost-effective solution that eliminates lock nuts and wire nuts. Easily insert the fixture's conductors into the corresponding ports on the WAGO connector and you're finished. No wire nuts to twist or taping required. Average Time Savings: 45% or up to three (3) minutes per fixture installation. Approximate “installed” cost savings per fixture: $2.00 - $3.00. 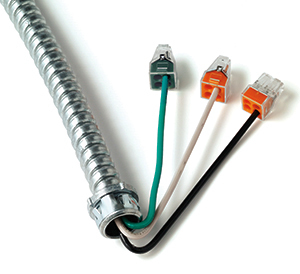 Solid or Stranded THHN Conductors enclosed in 6-feet of 3/8" (.375") Flexible Steel Conduit - Standard. When you add-up your time and material cost, it makes economic sense to buy "pre-fabricated", ready-to-install QuikWhips from Engineered Products Company. 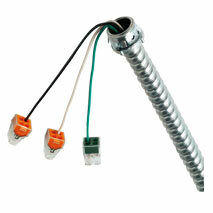 NOTE: The ground bonding conductor on each end of the QuikWhip includes a "green" WAGO grounding conductor. © The WAGO connector is a registered trademark of the WAGO Corporation, Germantown, Wisconsin.